There are multiple soft tissue sarcomas with varying degrees of aggressive behavior, but virtually all have the capacity to metastasize and cause death. 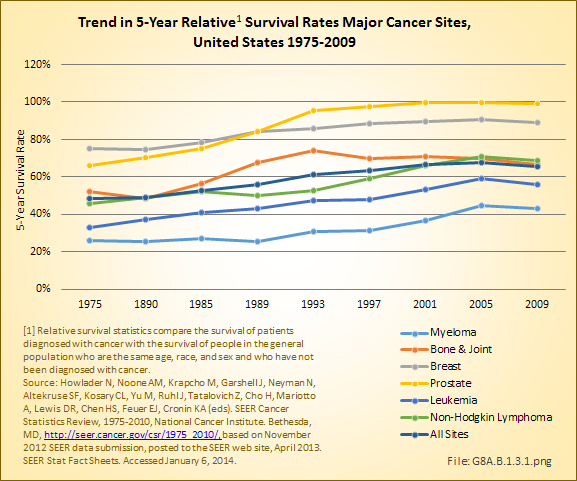 Treatment for high-grade soft tissue sarcomas is typically resection (removal) and radiation. 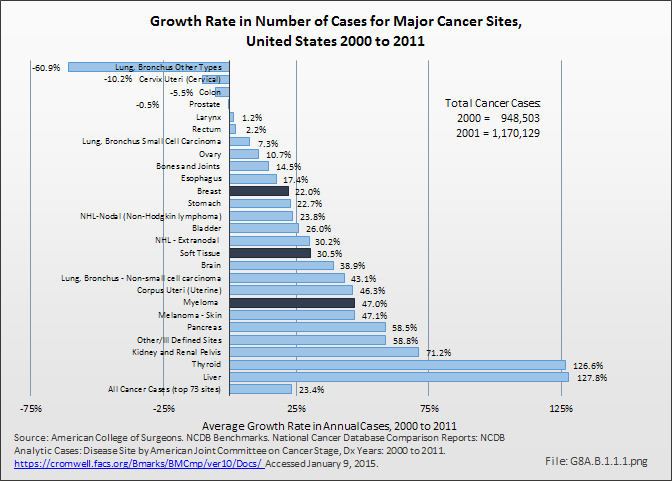 Chemotherapy is playing an ever-increasing role, especially in high-grade (fast-growing) and metastatic cases. The most commonly encountered soft tissue sarcoma is malignant fibrous histiocytoma, a tumor of the fibrous tissue most often occurring in the arms or legs. The least differentiated of the sarcomas, in many cases it represents a poorly defined, high-grade soft tissue sarcoma that cannot be further defined pathologically (histologically). A recent trend is to classify these poorly differentiated sarcomas as pleomorphic sarcomas or spindle cell sarcomas not otherwise specified, (NOS) rather than the previous designation as malignant fibrous histiocytoma. 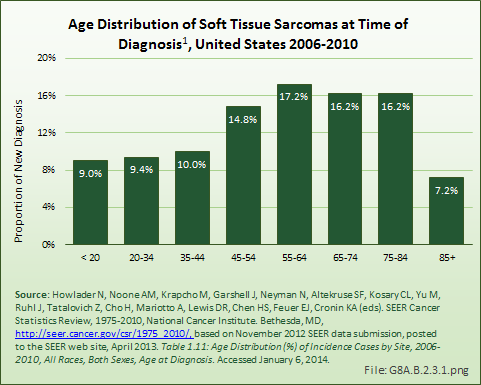 Poorly differentiated sarcomas typically affect older individuals. Analysis of annual rates of MFH and PS reflect this evolving diagnostic trend. The next most commonly encountered and reported soft tissue sarcoma is liposarcoma, which is a malignant tumor of the fatty (adipose) tissues. This sarcoma also is more common in older persons. There are several subtypes ranging from the low-grade lipoma-like liposarcoma that rarely metastasizes to high-grade pleomorphic liposarcomas and round cell liposarcomas, which have a prognosis similar to malignant fibrous histiocytoma. Liposarcomas can develop anywhere in the body, but they most often develop in the thigh, around the knee, and inside the back of the abdomen. Seen in a wide range of patient ages, liposarcomas occur most frequently in adults between 50 years and 65 years old. Some liposarcomas grow very slowly, whereas others can grow quickly. 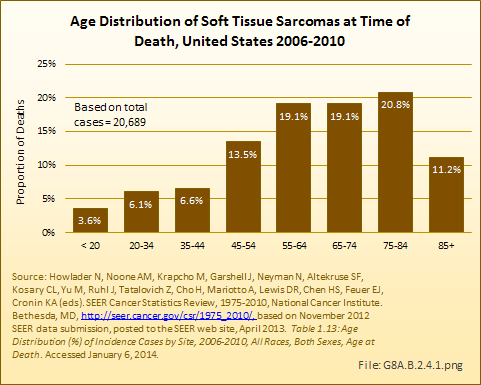 The third most commonly encountered soft tissue sarcoma is synovial sarcoma, which is more likely to affect younger adults than previously mentioned sarcomas. The most common location is the thigh. 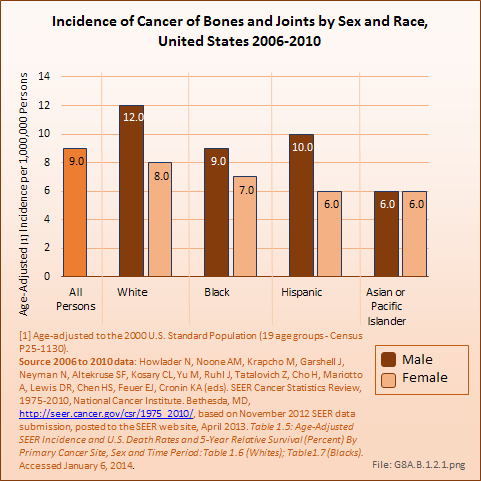 Despite the name synovial sarcoma, most do not occur in joints or in the synovium of joints. It tends to occur mostly in young adults, but can also occur in children and in older people. 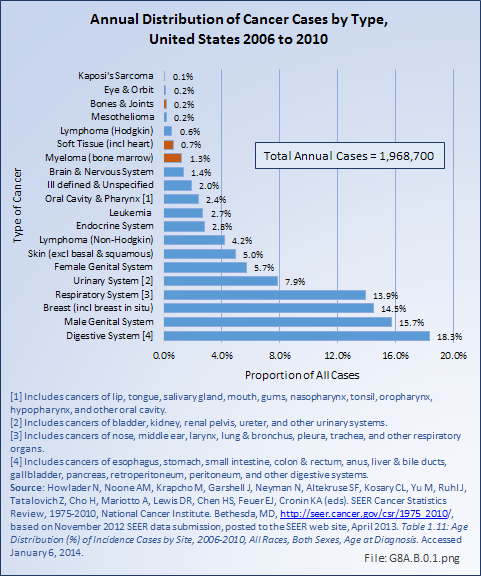 Many of these cases respond very favorably to chemotherapy with significant shrinkage of the tumor, although resection (surgical removal) and radiation remain the cornerstones of current therapy. The prognosis is similar to malignant fibrous histiocytoma and the other high-grade soft tissue sarcomas mentioned above. Smooth muscle cells are found in internal organs such as stomach, intestines, blood vessels, or uterus. This muscle tissue gives these organs the ability to contract involuntarily. Leiomyosarcomas are malignant tumors of involuntary muscle tissue. They can occur almost anywhere in the body, but most often are found in the uterus. A second common site is the retroperitoneum (back of the abdomen) and in the internal organs and blood vessels where leiomyomas also arise. Less often, they develop in the deep soft tissues of the legs or arms. They tend to occur in adults, particularly the elderly. Since they often arise from arteries, resection of these tumors frequently requires an immediate vascular reconstruction. Malignant schwannomas, neurofibrosarcomas, or neurogenic sarcomas are malignant tumors of the cells that surround a nerve. The currently favored name for these sarcomas is malignant peripheral nerve sheath tumor. Malignant tumors can develop either from blood vessels (hemangiosarcomas) or from lymph vessels (lymphangiosarcomas). These tumors often develop in a part of the body that has been exposed to radiation. Angiosarcomas are sometimes seen in the breast after radiation therapy for breast cancer or in the arm on the same side as a breast that has been irradiated or removed by mastectomy. They are difficult to cure as they spread through the bloodstream to other parts of the body and often spread extensively through the local tissues. This is a less aggressive blood vessel tumor than Hemangiosarcoma, but still considered a low-grade cancer. It usually invades nearby tissues, and sometimes can metastasize to distant parts of the body. It may develop in soft tissues or in internal organs, such as the liver or lungs. These cancers are composed of cells similar to those lining blood or lymph vessels. In the past, Kaposi’s sarcoma was an uncommon cancer mostly seen in older people with no apparent immune system problems. It is now most common in people with human immunodeficiency virus (HIV) infection and the acquired immunodeficiency syndrome (AIDS), but can also develop in organ transplant patients who are taking medication to suppress their immune system. It is probably related to infection with a virus called human herpesvirus-8 (HHV-8). Fibrous tissue forms tendons and ligaments and covers bones, muscles and joint capsules, as well as other organs in the body. MFH is found most often in the arms or legs. Less often, it can develop inside the back of the abdomen. This sarcoma is most common in older adults. Although it mostly tends to grow locally, it can spread to distant sites. It is the most commonly diagnosed soft tissue sarcoma, although now these are more often classified as pleomorphic sarcoma, not otherwise specified (NOS), as discussed above. 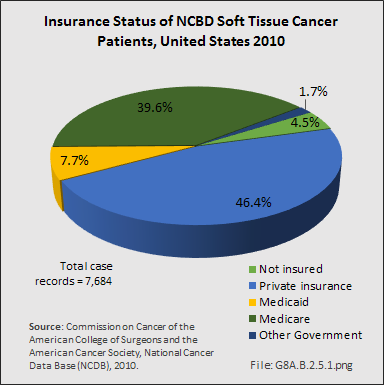 Fibrosarcomas are cancers of fibrous tissue. They have a characteristic herringbone cloth pattern when viewed under the microscope. Fibrosarcomas most commonly affect the legs, arms, or trunk. They are most common between the ages of 20 years and 60 years, but can occur at any age, even in infancy. These tumors are slow-growing cancers of the fibrous tissue beneath the skin, usually noted in the trunk or limbs. They invade nearby tissues but rarely metastasize. They primarily affect young adults. Due to their slow, insidious growth; their uncommon occurrence; and their innocuous appearance, diagnosis is often delayed. 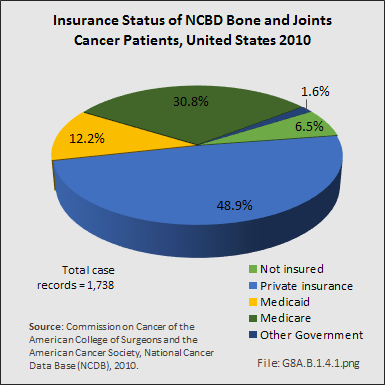 The local recurrence rate is higher than many sarcomas, and has been reported to be as high as 50% in some studies. 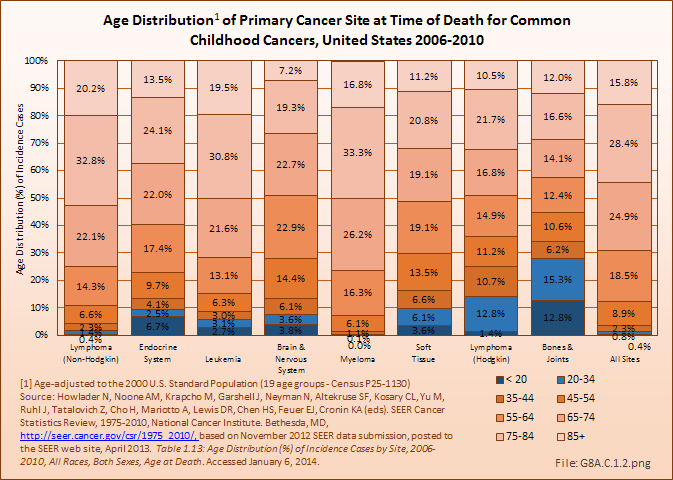 While death due to disease is uncommon (<5%), the local recurrences can cause significant local morbidity. Fibromatosis is one of the names given to neoplastic tumors with features in between fibrosarcomas and benign tumors, such as fibromas and superficial fibrous diseases like Dupytren's disease. They tend to grow slowly, but often steadily. These tumors are often referred to as desmoid tumors. Although they do not metastasize, they do form in response to genetic alterations identical to many cancers and can cause great disability and even death. These tumors can invade nearby tissues, causing great havoc and occasionally even death. Some doctors may consider these to be a type of low-grade fibrosarcomas; most, however, regard these as benign but locally aggressive. Certain hormones, particularly estrogen, may increase the growth of some desmoid tumors. Antiestrogen drugs are sometimes useful in treating desmoids that cannot be completely removed by surgery. Radiation therapy plays a role in treatment, especially in unresectable or recurrent cases. There are ongoing chemotherapeutic trials in place with newer agents that interrupt the various biological processes in the growth of these tumors; these hold great promise for future patients. Additional research into the biology and treatment of these and virtually all tumors is clearly indicated. Through microscopic examination and other laboratory tests, doctors can usually find similarities between most sarcomas and certain types of normal soft tissues, thus, allowing them to be classified based on this histologic appearance. However, some sarcomas have not been linked to a specific type of normal soft tissue due to their unique appearance that does not closely resemble any single tissue type. 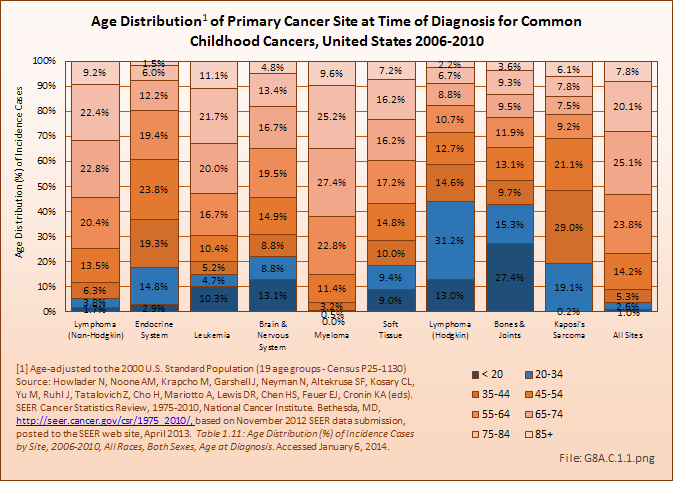 This rare cancer primarily affects young adults. The legs are the most common location of these tumors. This is one of the most vascular (blood vessels) sarcomas because it induces an extensive network of vessels to grow in and around the tumor. 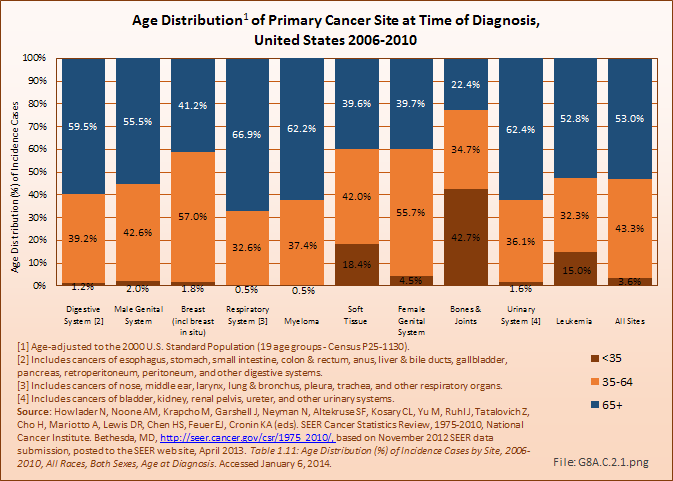 Because of their very slow growth rate, a delay in diagnosis can occur. 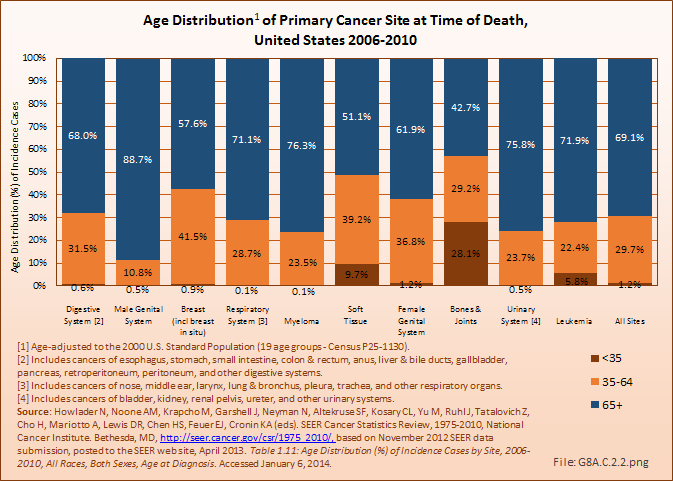 Unfortunately, it ultimately has a high mortality rate and can lead to death years after diagnosis. The rate of progression can be quite slow; late metastases are common. This sarcoma often develops in tissues under the skin of the hands, forearms, feet, or lower legs. Adolescents and young adults are often affected. These are often misdiagnosed as infections and chronic infectious ulcers because of their innocuous appearance and uncommon occurrence. This sarcoma has a much higher propensity for lymph node metastasis than most sarcomas, which usually preferentially metastasize to the lung. This rare cancer often develops in tissues of the arms or legs. It recently has been determined to be a variant of malignant melanoma, a type of cancer that develops from pigment-producing skin cells. How cancers with these features develop in parts of the body other than the skin is not known. 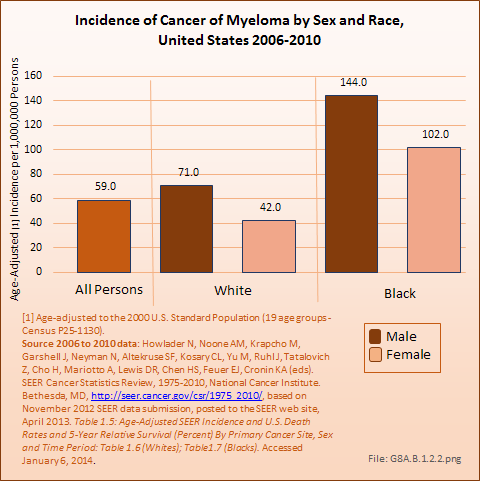 As a melanoma, it behaves differently than sarcomas. It has a propensity to spread through the lymphatic system. Local recurrence is common; therefore wide resections are required for complete local eradication. 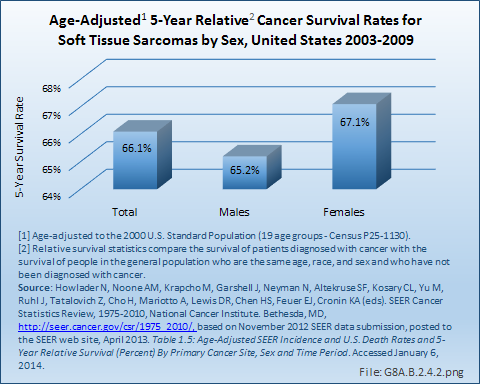 There are other types of soft tissue sarcomas, but they are less commonly encountered and not included in this discussion. 1. a. b. Weiss SW, Goldblum JR: Enzinger and Weiss’s Soft Tissue Tumors. 5th ed. St. Louis, MO: Mosby–Elsevier; 2008. 2. National Cancer Institute. 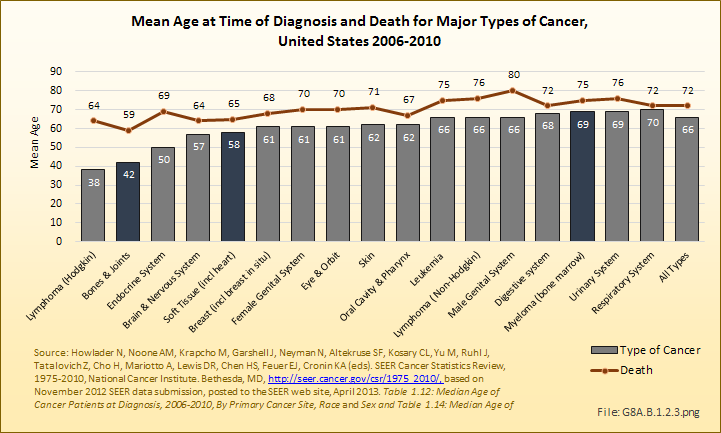 NCI Dictionary of Cancer Terms. Available at: http://www.cancer.gov/dictionary?cdrid=46445 Accessed February 11, 2015. 3. Weiss SW, Goldblum JR: Malignant Mesenchymoma, in Enzinger and Weiss’s Soft Tissue Tumors. 5th ed. St. Louis, MO: Mosby–Elsevier; 2008:1213-14.